Less to type, more to love (no more ads). Living in a super-insulated house, I get very excited when extreme cold weather arrives. 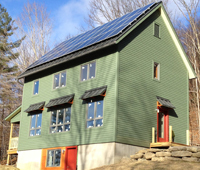 It is the only way to see how well the house performs in low temperatures. This January was the coldest month that we’ve lived in the house. We recorded 1380 HDD for January, 16% colder than January 2013. Our coldest day was January 3rd, with 69.7 HDD. Temperatures on this day ranged from a high of 2.8°F to a low of -8.5°F. 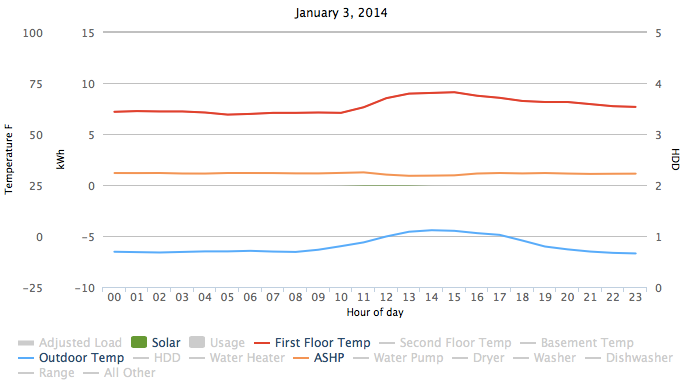 Indoor temps ranged from 60°F at night to 70.5°F during the day. I was particularly interested in how our air-source heat pump (ASHP) would perform in these long stretches of cold weather. Our unit (Mitsubishi MSZ/MUZ-FE18NA) is rated to keep producing heat down to -15°F. According to the specifications, the unit can produce 10,300 btu/hr at 5°F. In order to determine how well the house performed thru the month I decided to keep the backup heat (electric resistance) off. This meant we relied only on our ASHP and the sun to heat the house for the month. 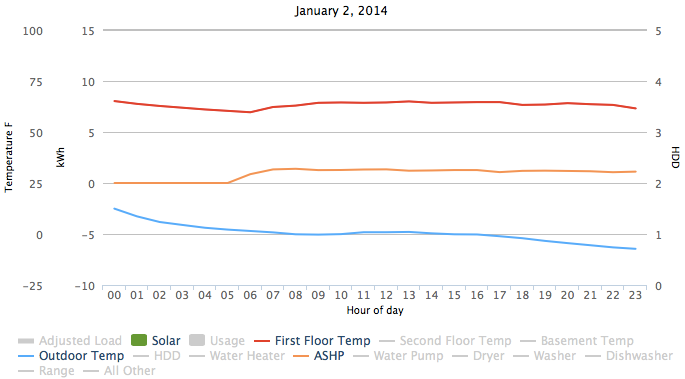 Looking at the data for January, it looks like our heat pump starts to fall behind demand when temperatures slip below zero. This appears to happen mainly at night. During the day, a small amount of sunlight can raise indoor temps even in the extreme cold. January 1-3 offer a good example. I normally turn the heat down at night or off. I did this the night of January 1st. Night temps were not particularly cold, but continued to drop throughout the next day. By 7am Jan 2nd, the inside temp got down to 60°F and the outside temp had reached zero. By the time I turned on the heat again in the morning, the ASHP was not able to make up the difference for most of the day. A little sun helped get the inside temp up to a high of 64°F. On Jan 3rd, I considered turning on the backup heat, but I held out because the forecast said clear skies. By the afternoon inside temps were back up to 70 while outside temps hovered around 2°F. By Jan 4th, outdoor temps were well over the zero mark. The January 2nd experience and a fortuitous conversation with Mike Duclos that day, convinced me to leave the thermostat set to 68°F when temperatures are forecast to be in single to negative digits overnight. This makes it easier for the ASHP to keep up with the demand and lowers the temperature differential it has to make up. 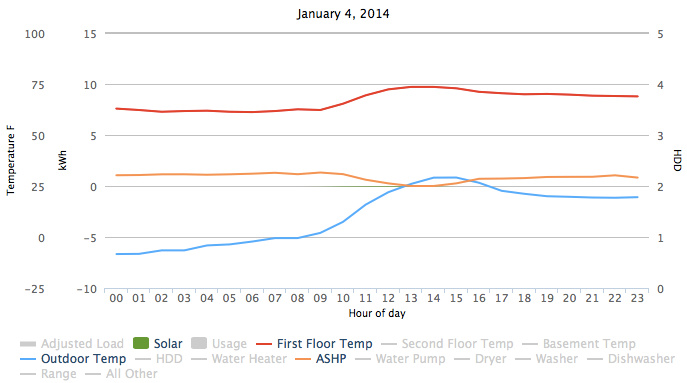 In total, our ASHP used 529 kWh in January. If we paid for electricity, our heat would have cost us just under $80. Check out the interactive version of these charts on my other site, Netplusdesign.